Luna Display is the only hardware solution that turns any iPad into a true, wireless second display for your Mac. 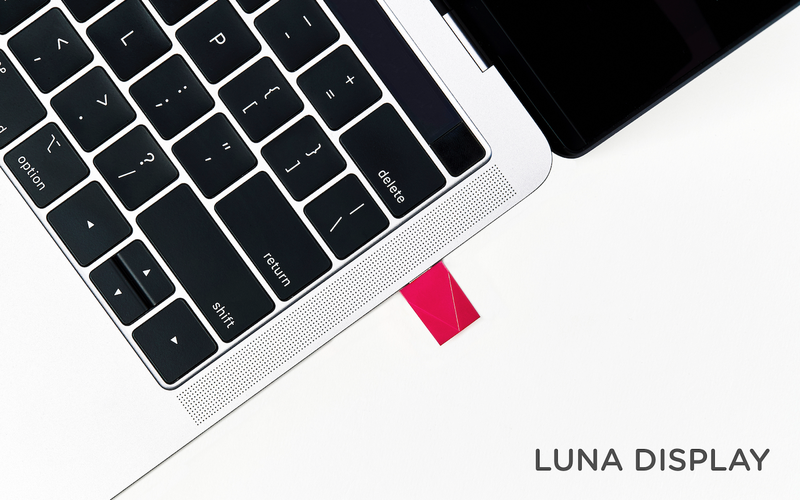 Available in USB-C and Mini DisplayPort versions, Luna Display is incredibly simple to set up. Just plug it into your Mac, and launch its free iPad and Mac companion apps, and your Mac automatically recognizes your iPad as a second display. Everything works seamlessly over WiFi, but if WiFi is unavailable, you can use a USB connection instead. Once you’re up and running, you’ll be blown away by Luna Display. It’s lightning fast with crystal clear image quality thanks to proprietary LIQUID Technology that ensures reliable performance and wireless flexibility. The image quality is doubly remarkable when you realize that it’s all being done wirelessly. Using your iPad as a second display is a game changer. Luna Display not only expands your screen real estate without having to buy a second display, but its portability frees you to work wherever you please. Better yet, Luna Display brings touch interaction to the Mac. Luna Display is fully compatible with external keyboards, the Apple Pencil, and touch gestures. Also, if you’re an artist, Luna Display is an excellent companion to Astropad, which turns your iPad into a Mac graphics tablet. Luna Display is available for $79.99, but MacStories readers can purchase Luna Display for 10% off by using the promo code MACSTORIES at checkout. That’s a great deal, but it ends December 1, 2018, at 11:59 PM CST, so don’t delay. Luna Display also makes a great holiday gift for friends and family. Turn your iPad into a second display today with Luna Display. Our thanks to Luna Display for sponsoring MacStories this week.